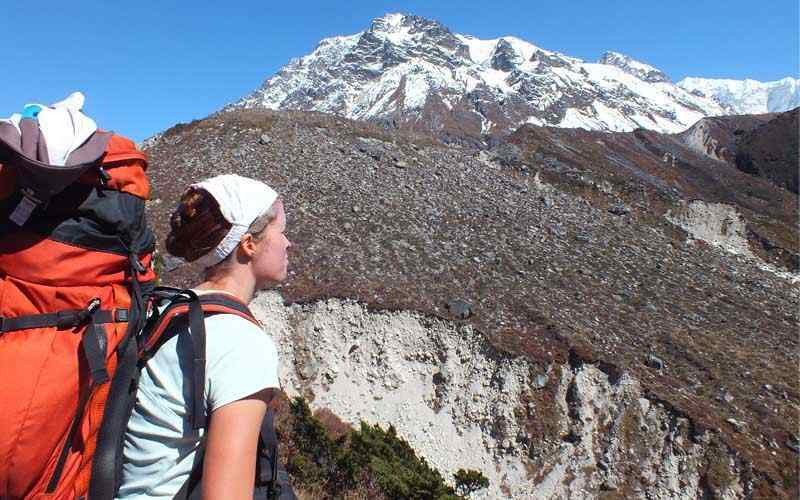 Sikkim Goecha-la Trek is one of the most fascinating trip in Sikkim & Darjeeling. Experiencing tremendous views of Mt. Kanchenjunga in North Sikkim and from Darjeeling, straddling the border with Sikkim & Nepal. 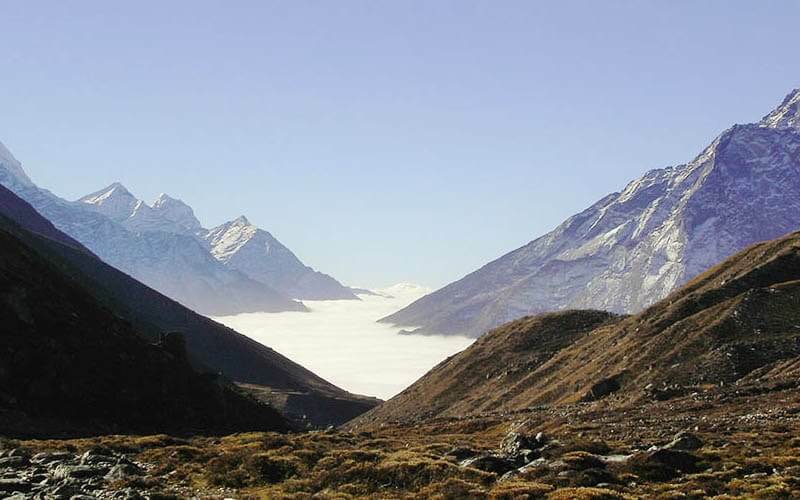 Sikkim Goecha-la Trek offers breath taking views of world’s high mountains Mt. Kanchenjunga (8,586 m-28,169 ft), Kabru (7,353 m–24,124 ft) and Talung (7,349 m-24,111 ft), Mt. Jannu (7,710 m-25,295 ft). 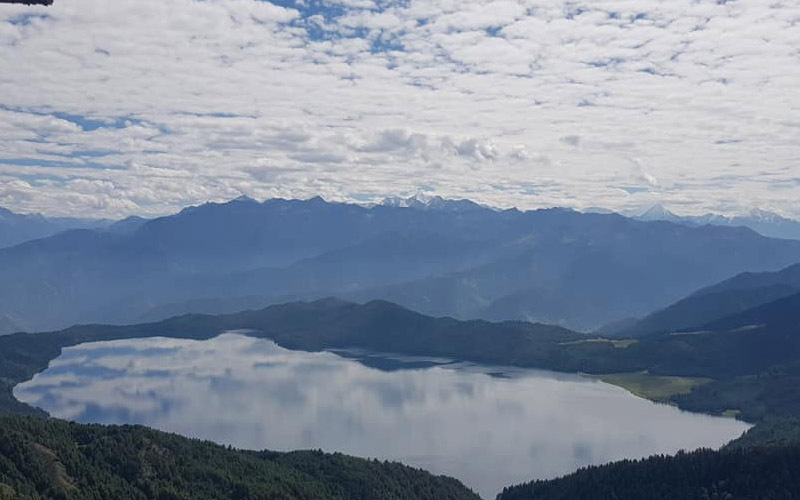 Along the ridge, facing North, enjoy very clear views of Kokthang (6,147 m-20,167 ft), Rathong (6,679 m-21,913 ft), Kabru South (7,317 m-24,006 ft), to the east, breathtaking sights of beautiful Pandim (6,691 m-21,952 ft), 5th highest Mt. Makalu (8,463 m-27, 766 ft), Baruntse (7,160 m-23,491 ft), world highest Mt. Everest (8,848 m-29,29, 029 ft), the 4th highest Lhotse (8,516 m-27,940 ft) and the whole range of Khumbakarna Himalaya with many other adjoining smaller peaks in the far horizon. This amazing Sikkim Goecha-la Trek starts with a short scenic flight to low warm area south east Terai of Nepal at Bhadrapur. Take an interesting drive to the starting point of this wonderful trek in Darjeeling popularly known as “Queen of the Hills” where we can find world famous Darjeeling Tea. We have great sights of Pass tea plantation in the rolling hills. Drive through the charming villages of Kurseong, Ghoom, Sunadha. Follow the famous small Toy Train Railway tracks. 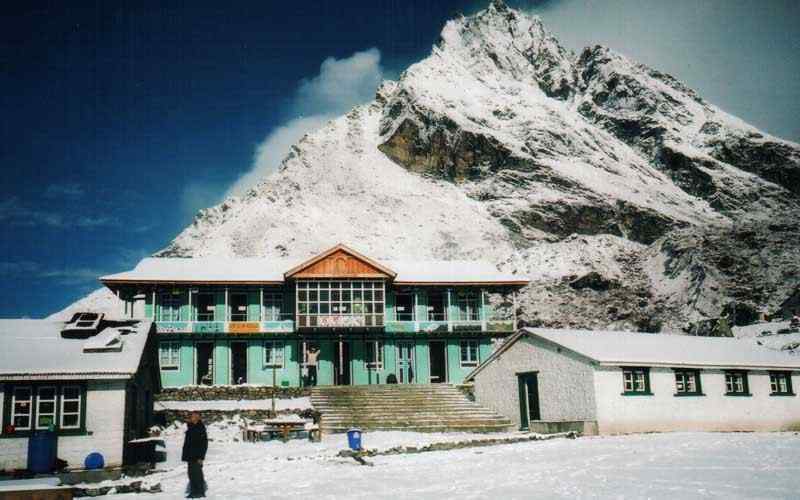 Sikkim Goecha-la Trek range was put in the trekking map in the early 20th Century. The traditional Goecha-la, Singalila Ridge trek begins from Yuksom in Sikkim, the old capital of Sikkim when it was an independent kingdom. In 1976, India took over this small country and annexed as state of Sikkim of India. In Darjeeling take a wonderful tour which includes stunning sunrise at Tiger Hill, a visit to Asia’s first Himalayan Mountaineering Institute and Zoological Park. Here find the breeding and conservation of the rare Snow Leopard and Red Panda along with other Himalayan mammals. Experience Darjeeling’s colorful market and the tea gardens. Following the Darjeeling, drive to Yuksom in Sikkim and begin our adventure on the high hills in the shadow of massive Mt. Kanchenjunga. 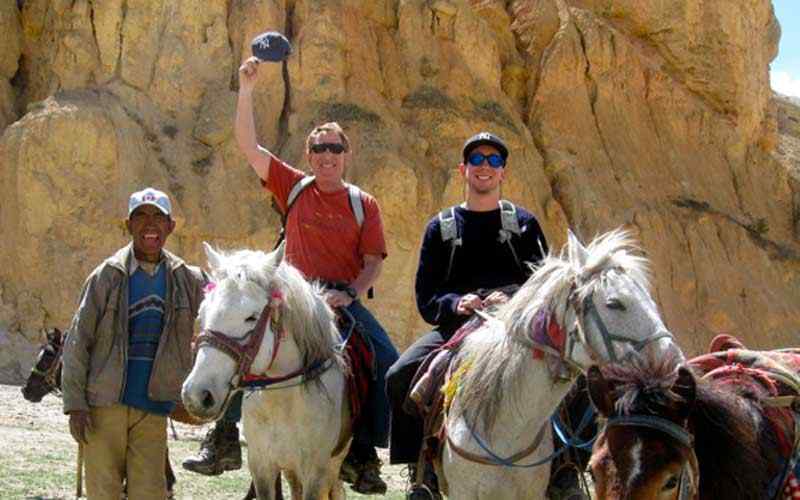 The Trek begins with a walk through dense sub-tropical forests and past vast pasture lands of grazing yaks. Moving forward, walk towards the alpine region leaving the lush vegetation behind for arctic Himalayan plants and shrubs of juniper and dwarf rhododendron bushes (azaleas). 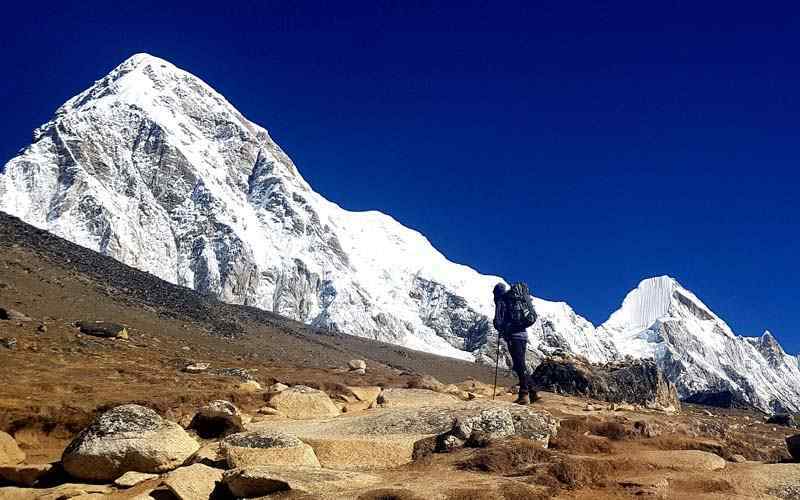 Once around the alpine region around Singalila ridges with great views of snow capped peaks every day on the trek, walk slowly to reach our highest destination at Goecha-la at 4,942 m-16,214 ft. This place offers fabulous views of world 3rd highest Mt. Kanchenjunga with other distant peaks including Makalu and Mt. Everest. After a remarkable adventure and experience in the high Sikkim Himalayan country, walk back on the same route to Yuksom with a scenic drive to Kalimpong, the 2nd largest town of Darjeeling district. Kalimpong, is the gateway to Sikkim, Bhutan and to Tibet. It is a sleepy charming town with touch of British Raj heritage. After an overnight, drive back to the Nepal border at Kakarvita and to Bhadrapur for scenic sweeping flight back to Kathmandu or transfer to next destination on your program..
Day 03: Fly to Bhadrapur (240 m-787 ft) and drive to Darjeeling (2,116 m-6,942 ft) - 05 hrs. Day 06: Drive to Pelling (2,060 m-6,758 ft) in Sikkim - 05 hrs. Day 07: Drive to Yuksom (1,780 m-5,839 ft) - 04 hrs. 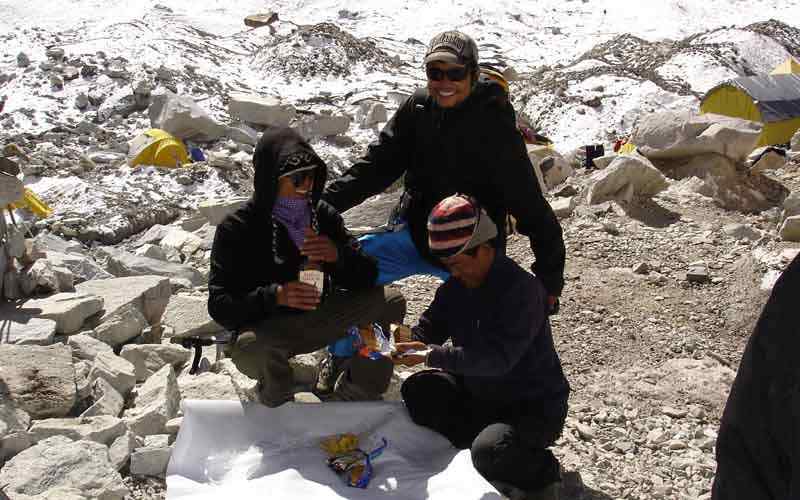 Day 08: Trek to Tsokha (Chokha) (3,006 m-9,862 ft) - 06 hrs. Day 09: Rest day at Tsokha for acclimatization and explore the village. Day 10: Trek to Dzongri (4,030 m-13,222 ft) - 05 hrs. Day 11: Trek to Thangsing (3,780 m-12,402 ft) - 04 hrs. Day 12: Trek to Samiti Lake (4,308 m-14,134 ft) - 04 hrs. Day 13: At Samiti Lake for hike to Goecha-la (4,942 m-16,214 ft )- 06 hrs both ways. Day 14: Trek to Kok-Tshering (3,550 m-11,647 ft) - 06 hrs. Day 15: Trek to Tshoka (3,006 m-9,862 ft) - 04 hrs. Day 16: Trek to Yuksom (1,780 m-5,839 ft) -06 hrs. Day 17: Drive to Kalimpong (1,200 m-3,937 ft) - 04 hrs. Day 18: Drive to Bhadarpur for afternoon flight to Kathmandu. After morning breakfast, free day for trek preparation. 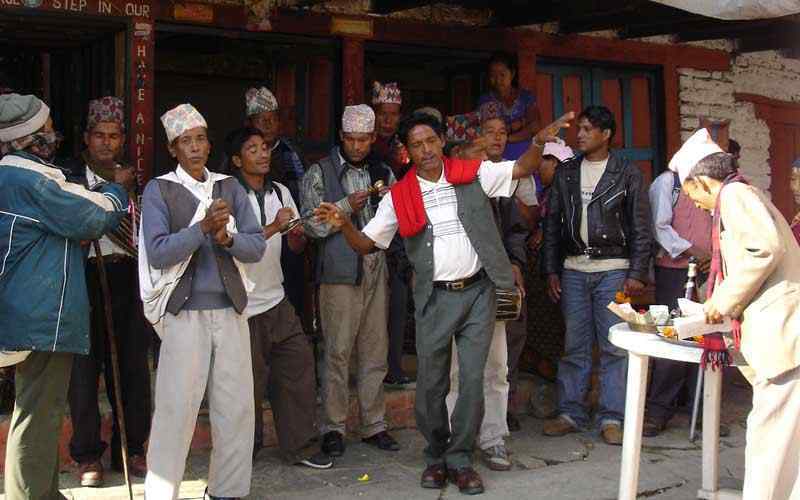 OR, do a sightseeing tour in Kathmandu valley visiting fascinating heritage and cultural sites. There are few places that are worth to visit such as holy Pashupatinath temple, Bouddhanath, Swayambhunath (Monkey Temple), Durbar Squire ( One is in Kathmandu, in Patan and also in Bhaktapur), Museum, monasteries, old historical Palaces and Gardens. Note: this tour is optional so you can visit with place of your interest & pay locally. In the morning leave the hotel for the wonderful journey to Darjeeling. Reach the Kathmandu domestic airport, board the plane for a super scenic flight to Bhadrapur at the far South East of Nepal near India border. 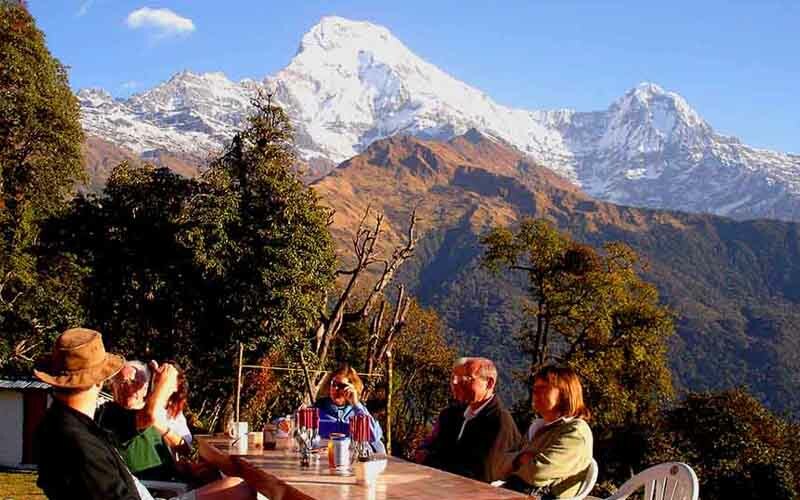 Enjoy views of mountains from Ganesh, Langtang, Jugal Himal to Everest, Makalu and Kanchenjunga range. After a 45 minute pleasant flight reach the warm sub-tropical area at Bhadrapur. Drive towards mid hill around cooler area to Darjeeling for overnight stop. Darjeeling is world famous for its tea with vast plantations. 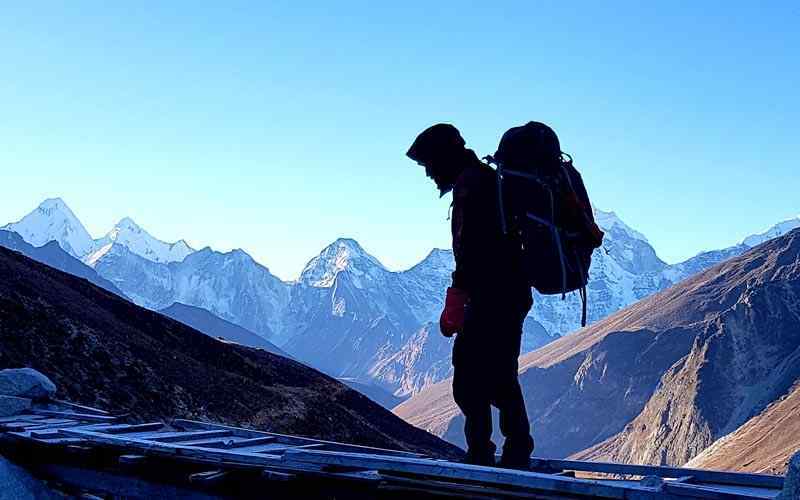 In the morning our local guide from Darjeeling (of Nepalese origin) receives you for the tour of Asia’s first Himalayan Mountaineering Institute, established by late Tenzing Norgay Sherpa (the 1st Everest summiteers with Hillary). This institute provides basic and advance climbing training. Visit a very interesting small Zoological Park housing for research and breeding rare Himalayan mammals such as the snow leopard and red panda. In the afternoon visit Tea Gardens. Darjeeling is world famous with its many gardens. These gardens are more than 100 years old and were started by British. Visit the Tibetan Refuge Center for handicrafts. Ride the Toy Train enlisted World Heritage roll. Before the break of dawn, take a short few hours’ drive to the high forested green hill on a winding uphill road to Tiger Hill at 2,590 m-8,482 ft. Here find an awesome viewpoint to catch the morning striking sunrise touches its first rays on top of Mt. Everest, Kanchenjunga, Lhotse and at Makalu with other range of Khumbukarna Himalaya mountains. This place is truly a fabulous place to be at in the morning with its tremendous scenery in the midst alpine forest of rhododendron, pines, oaks and magnolia trees. Afterward head down hill to Bhattese loop. There is where the toy train circles before it leaves to its next stations with the snow capped mountains as a backdrop. The train moves on toward at Ghoom the highest town of Darjeeling at 2,200 m-7,218 ft. It was built around 1879 and in 1881. The toy train railway is about 78 km-48 m long. Its elevation level varies from about (100 m-328 ft) at New Jalpaiguri to about 2,200 m-7, 218 ft at Darjeeling. Four modern diesel locomotives handle most of the scheduled services; including the daily Kurseong-Darjeeling return service and the daily tourist trains from Darjeeling to Ghoom (India’s highest railway station). In Ghoom visit the monastery which enshrines an image of the Matriya Buddha (the future-coming Buddha). Return to the hotel for an afternoon at leisure for independent activities. After morning breakfast take a shorter drive than previous day to Yuksom. Climb uphill from the town of Legship. Arrive in Yuksom for first overnight in tents with camping facilities including separate unit of kitchen staff, cooks and guide. Yoksum was the first capital of Sikkim (before annexed with India in 1976 AD). 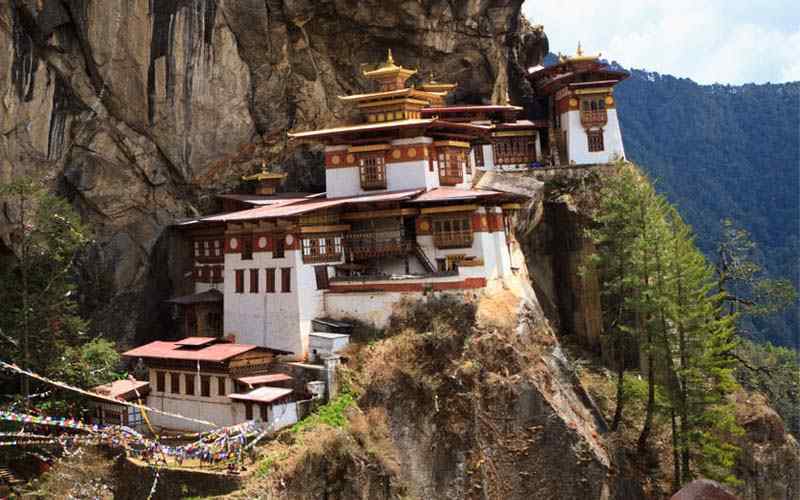 It was here that the 1st Chogyal (king) was consecrated by three great holy Lamas in 1642 AD. 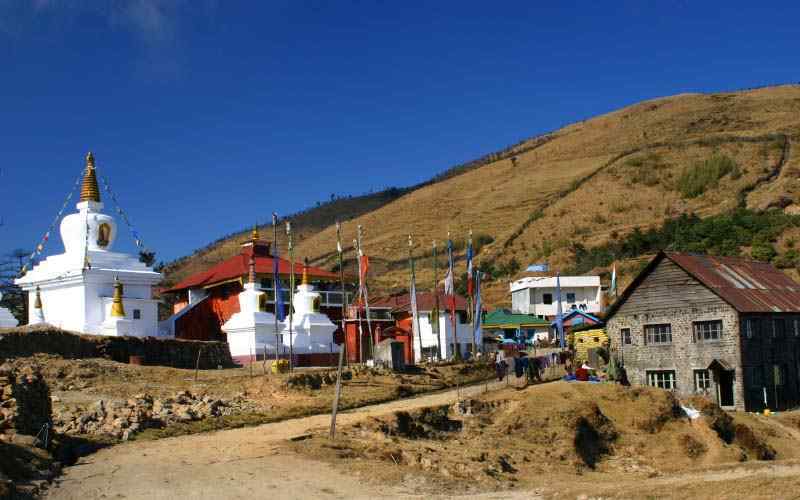 In Yoksum, with time for stroll around the villages, take a short uphill climb to visit Dubdi monastery one of the oldest in Sikkim. 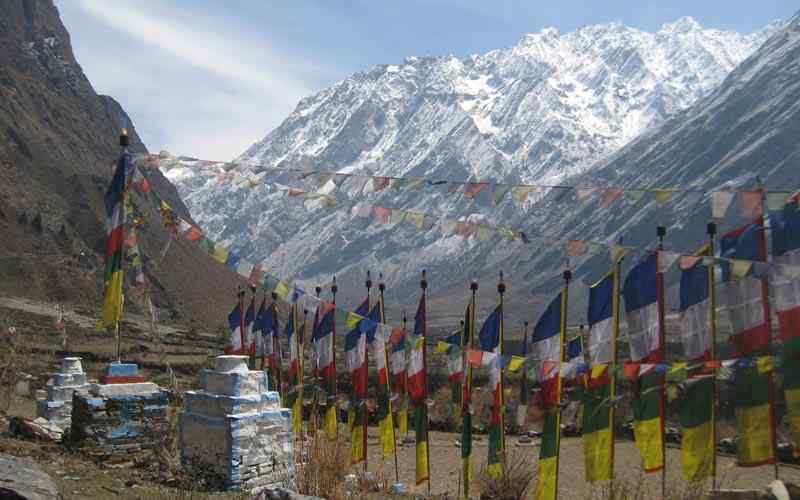 Today is our first day trek to Goecha-la on the Himalayan high hills and Singalilla ridge. Our adventure begins after breakfast on the Tsokha trail. It skirts into meadows and meanders through small farm villages. After an hour’s climb on a gradual walking path through a sub tropical forest, to cross a suspension bridge. Make a steep climb for four hours on a path lined with sky embracing trees and floor carpeted with leaves and small flowers. Arrive at Bakim, a small farm village. From here make another hour uphill climb to reach the overnight camp at Tsokha, the last village on route to our destination at Goecha-la. Tsokha a small Tibetan village consisting of a dozen houses and a monastery with a Government Trekkers Hut. 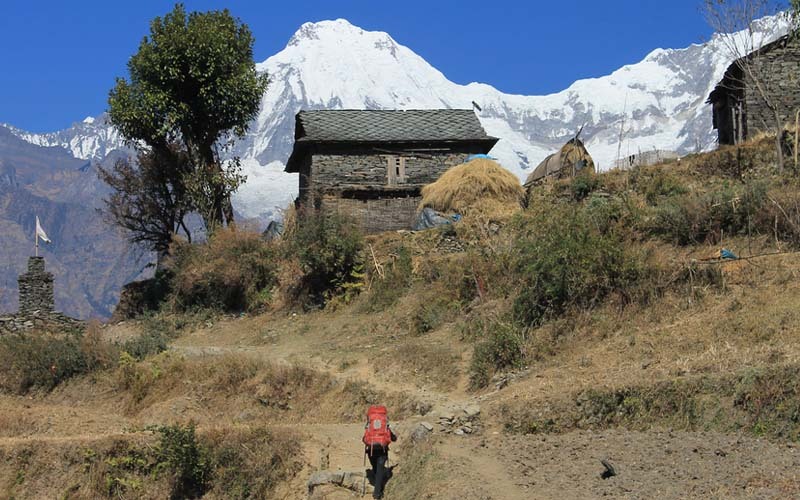 Overnight camp is set on the farm fields with a view of Pandim peak towards northeast. A leisure day for local excursion around Tshoka village. Explore around with a visit of an old monastery and with a free afternoon for rest and acclimatization and to catch with your dairy. After a wonderful time with the rest day at Tsokha our walk leads uphill past the monastery. Walk through an enchanting forest of rhododendron, pines, hemlocks and magnolia. After a steep 2 hour climb reach a wide clearing with pasture field at Pedhang for lunch. Pedhang is a nice place with a summer pasture for Yaks and other animals. Find one small cattle herders’ hut and an old rundown view tower. From here walk leads to a steep climb on the Singalila ridge reaching at Deurali that offers a magnificent view of the massive bulk of Mt. Kanchenjunga and Kabru peak. After short break continue to walk for another hour leaving the tree lines behind and now encounter sparse vegetation of dwarf rhododendron (azalea) and juniper bushes. Reach the top of another wide alpine valley at Dzongri and find several shepherds huts. Overnight camp at Dzongri on this pleasant valley overlooking Mt. Pandim, just above the camp find an excellent view of Kanchenjunga and array of smaller snow capped peaks. Today’s walk leads us on a relatively gradual trail with a clear view of Mt. Kanchenjunga. The morning walk leads towards north west for a while. The path follows a short gentle climb with pleasant walk most of the way before descending to a river. Here find reach a small hut by the river. Walk back into tree lines of pines and firs, rhododendron. After a short break, walk continues with a gentle climb and with few steep sections till it opens into a wide glacial valley in Thangsing. Stop for lunch and overnight stay. 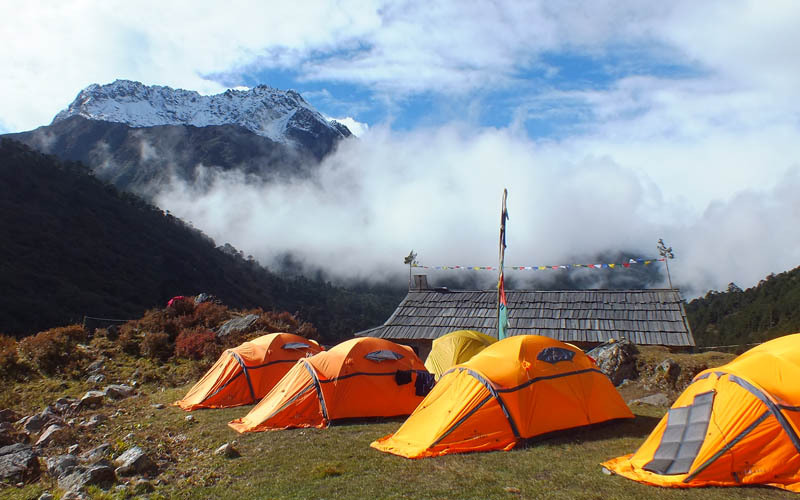 Thangsing is one of the best camping fields as well as a log cabin serving as Guest House for trekkers. From this lovely spot, make a short day walk to camp at Samiti lake. The morning walk follows with a gradual climb for an hour or more to reach the end of the glacial valley. 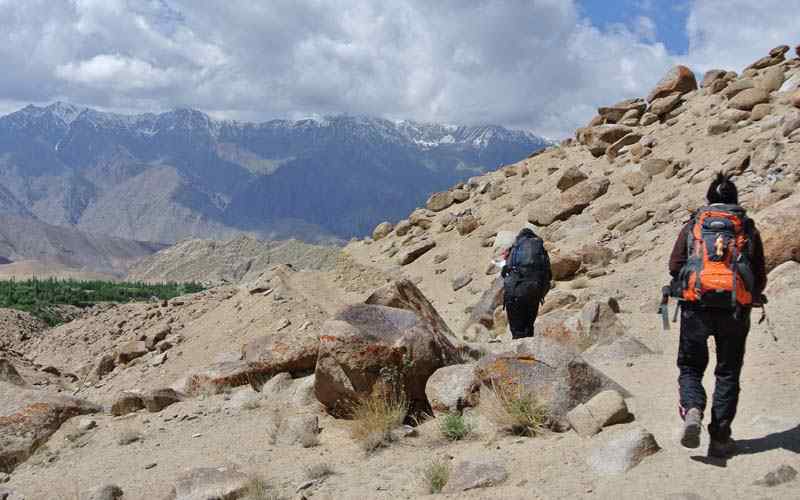 Upon on leaving the valley make a steep climb on a rocky path with moraines. Reach the ridge top for super views of snow capped peaks and the valley below. Take short downhill walk brings at Samiti Lake. 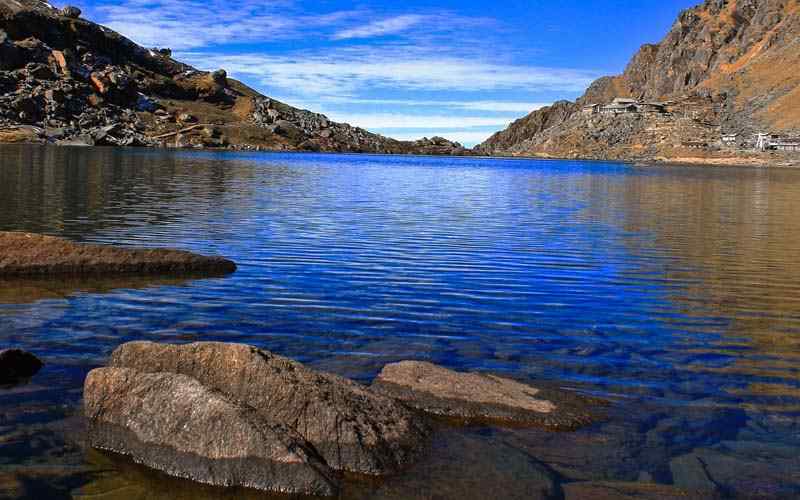 Samiti Lake is a sacred glacial lake. 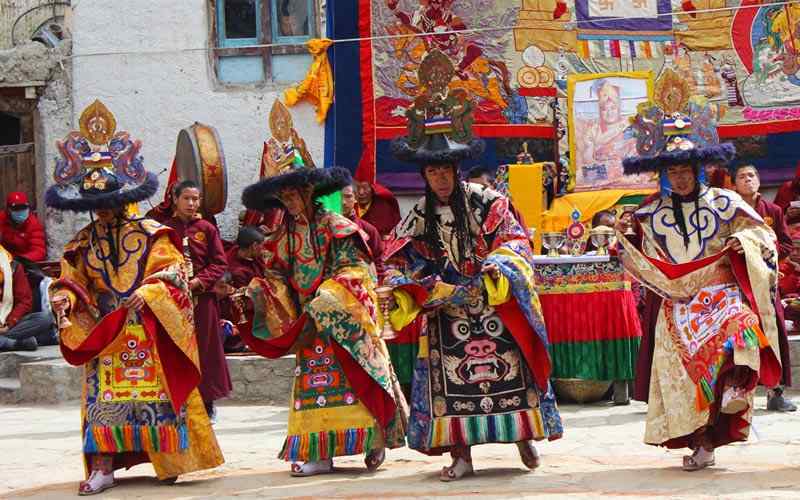 An important religious events take place here once a year at an auspicious time as per Tibetan Buddhist Lunar calendar. Camp next to a log cabin and Guest House for trekkers and pilgrims. A great spot for two overnight camps. Make an early morning trek to our highlight destination at Goecha-la. Walk starts with a climb through a gully on an uneven path over moraine and boulders. The strong walk reaches the top of Goecha-la at 4,942 m-16,214 ft with super views East Face of Mt. Kanchenjunga. After a great time here return trek back to camp at Samiti Pokhari. From Samati Lake walk to Thangsing. Take an alternate route to Yoksom via Bakhim instead of going back to Dzongri. This alternate route descends all the way to Bakhim through the dense forests. From this spot our route meanders to a steep climb for an hour leading into dense a forest of rhododendron, firs, hemlocks and pines trees. Finally walk follows on a gradual path to our overnight camp at Koktshering on a junction of the Tshoka and Dzongri. 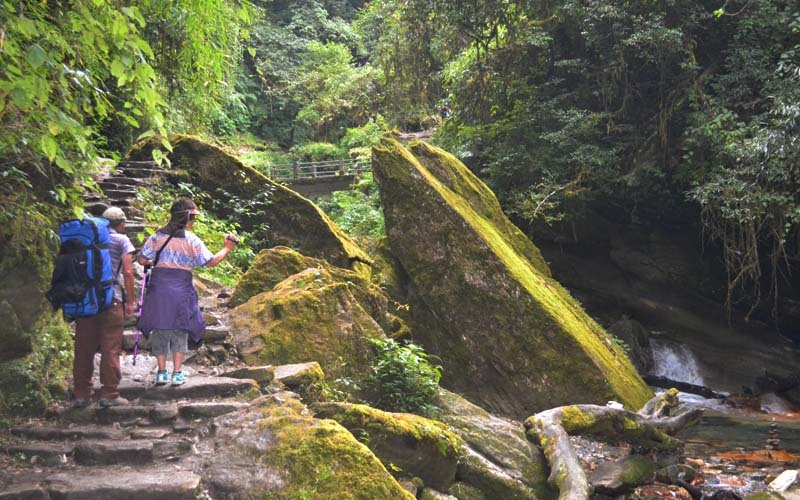 Kok-Tsering is located the midst of a beautiful forested area with chances to see some wildlife such as the Snow Leopard, Musk Deer, Himalayan Black Bear and other Himalayan wild life. This morning make a short day walk of 4 hours to reach back at Tshoka. Make a long descent back on the same route through cool shade of forest to reach at Tshoka for lunch and overnight stop. Today is the end of this wonderful trekking as the path leads on a downhill This morning make a short day walk of 4 hours to reach back at Tshoka. Make a long descent back on the same route through cool shade of forest to reach at Tshoka for lunch and overnight stop.slope through the forested area and then crosses the bridge over a raging fast river. The walk becomes pleasant on the nice winding path all the way to Yuksom for the last overnight camping in Sikkim and of this trip. Reach Yuksom for a farewell dinner with camping personnel. Enjoy the afternoon time with a short stroll around the village. From this nice village, the morning drive leads towards Testa River in Melle bazaar on route to Kalimpong. Our route diverts heading North East of Darjeeling at Kalimpong, another sub division town of Darjeeling district. Kalimpong is a quaint town situated at an altitude of 1,200 m-3937 ft, about 50 km from Darjeeling. It is a much warmer hill town. 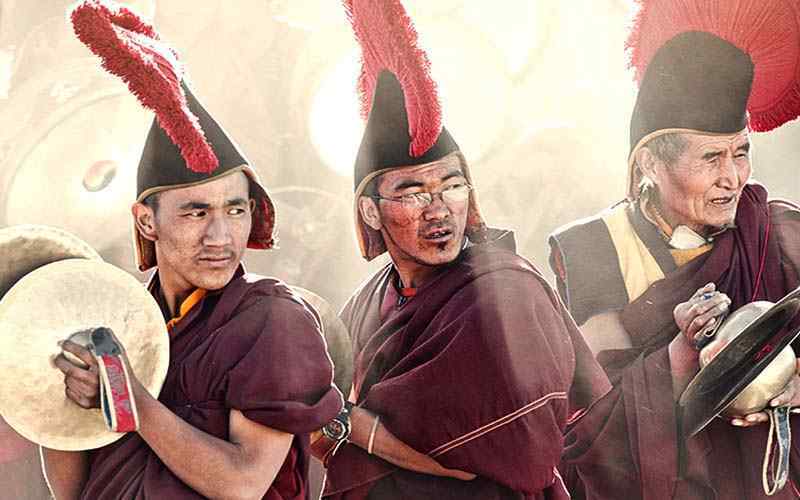 It was an early gateway to Tibet during the British Raj days of 1800 to 1947 AD. Kalimpong located on route Sikkim / Bhutan and to other parts of Indian cities like Siliguri. Kalimpong is famous for flower and orchids nurseries and it exports to other foreign countries. 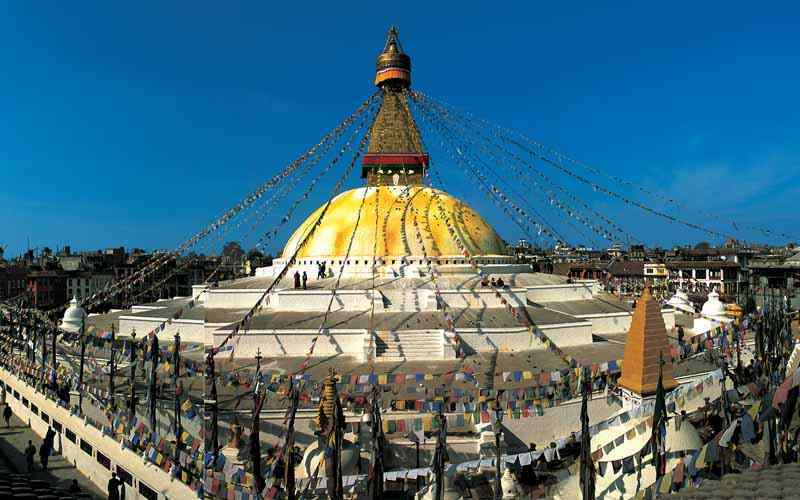 In the afternoon visit monasteries and a Nepalese Buddhist temple which offers magnificent views of the hills. In Kalimpong overnight is in the Hotel Himalaya (or similar). It is located near the town which still retains the touch of heritage from the British Raj era. After a nice time in this wonderful town, make a morning drive towards much warmer area in the low lands around a Siliguri city suburb and then head to Nepal border at Kakarvita. Complete visa and passport formalities on both sides of the border. The drive continues to Bhadrapur airport on time for a scenic flight back to Kathmandu. Board the plane for a sweeping 40 minute flight. Upon reaching Kathmandu, transfer back to hotel with afternoon free at leisure for individual activities. 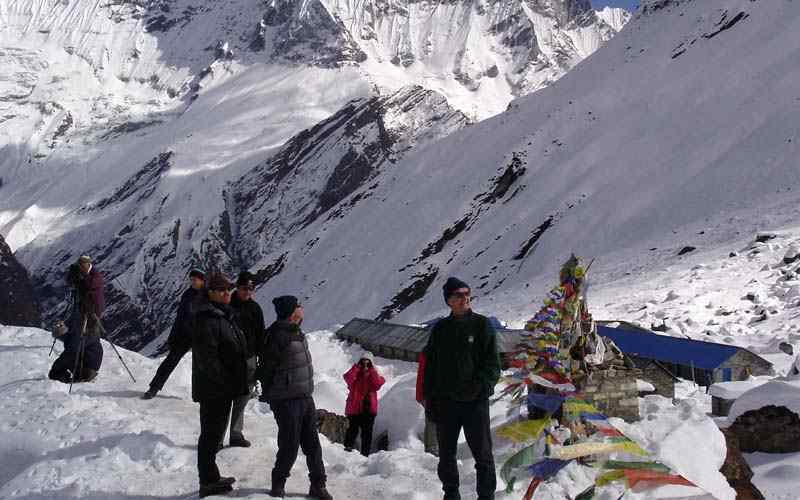 Today is your last day in Nepal with great memories and amazing experience of Sikkim Goecha-la Trek & Darjeeling Tour. Transfer to Tribhuvan International airport for final departure towards homeward bound or to next port of call. Meals- Lunch and Dinner at kathmandu and pokhara .